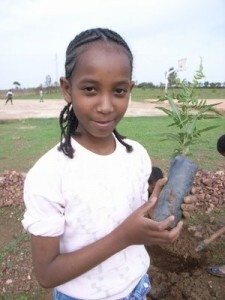 Student in Asmara school ready to plant trees grown with precious hand carried water. In July-August 2009 TerraCircle associate Tony Jansen worked in Eritrea as part of Australian NGO Live and Learn team producing a series of environmental education manuals for use in Elementary Schools in Eritrea. Eritrea has a very difficult environment and has been devastated by decades of war, but a very rich culture and history of agriculture in its diverse ecological zones. The Green Club manual encourages schools to establish modest food gardens and expand tree planting to include fruits, nuts and indigenous species. Much of Eritrea was once covered in forest but over 90% of this is now gone. The manual built on local experiences, expertise and knowledge where possible. The people are warm, strong and determined to see their country develop in its own way and have learned through their struggles to think outside the box and be very resourceful. The series of manuals is now being printed by UNICEF for the Eritrea Department of Education and will be provided to all Elementary schools in Eritrea and translated into the main local languages.